Why Aaliyah's Music Can't Be Streamed On Any Service? Home Entertainment	Have You Ever Wondered Why Aaliyah’s Music Can’t Be Streamed On Any Service? Music streaming service’s for most people have become a way of life. No one really has the time or disposable income to run out to the Target or what ever other store sells physical CD’s every time their favorite artist releases new music. Music streaming not only allows you to find your favorite music (old and new releases) within seconds but using some sort of tech algorithms these services suggest new music and even compile playlists for you. Streaming services know my musical taste better than I do sometimes. These are all of Aaliyah’s songs that are available on Apple Music and most other streaming services. There isn’t even an option of buying them. 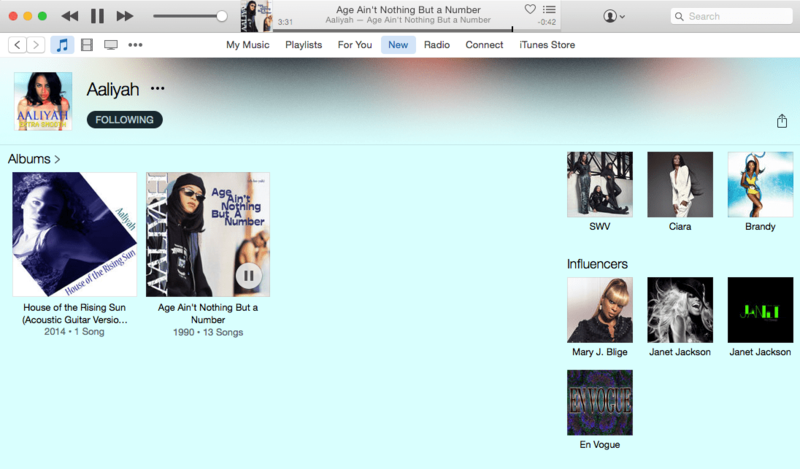 You may also enjoy “Apple Music vs. Spotify”; Which one is worth the money? Any Aaliyah fan and music streaming service subscriber know we CANNOT find any of Babygirl’s music with the exception of her first album “Age Ain’t Nothing But A Number”. After years of hopping from service to service and listening to sped up & slowed down renditions of Aaliyah’s beloved catalog on Youtube, I decided to get down to the bottom this. So the reason why Aaliyah’s music isn’t available for you to buy or stream is, you guessed it because of some messy music industry business involving Aaliyah’s former music label Blackground Records and owner of the label her Uncle Barry Hankerson. Hankerson managed Aaliyah and holds the masters to her music (with the exception of her first album Age Ain’t Nothing But A Number). If you tuned into the six part Docu-Series on Lifetime, Surviving R. Kelly, you also know Barry managed Kelly as well and played a part in the fraudulent marriage between him and Aaliyah when she was just 15 years old. After Aaliyah’s death, Blackground Records crumbled and Hankerson sold hundred’s of the hit songs that were under the label (including most of Aaliyah’s music) to Reservoir Media Management. Reservoir Media Management now has full rights to her music after acquiring it in 2012 and they are not releasing it to any streaming services (anytime soon at least). Listen, because I know the struggle, I have a little gift for you. Below is a Youtube Playlist with a majority of the songs that you can not listen to anywhere else from our beloved baby girl. A lot of you are probably just as in your feelings as I am about not being able to listen to Aaliyah as much as I’d like. What is your favorite Aaliyah album or track that you can’t stream and purchase/download? What is your favorite Aaliyah album or track that you can’t stream and purchase/download? aaliyahaaliyah birthdayaaliyah musicwhy can't I stream aaliyah music? I was wondering about all those Timbaland and Magoo and Tank Up Jumps the boogie anyone? I did not know this. Thanks for doing the research for us and sharing with the public. Ugh, the music industry can be so messy at times.